In the 1990’s, Tishcon’s patented, water soluble, Q-Gel® CoQ10 revolutionized the use of Ubiquinone Coenzyme Q10. Q-Gel®, with it’s 100% dissolution, provided blood CoQ10 levels several times higher than those achieved with other CoQ10 formulations -- in much less time and at lower dosage levels. Fast forward to today Tishcon has preformed the same “miracle” with Ubiquinol CoQ10. Introducing Quinogel® -- the first and ONLY water soluble Ubiquinol Coq10. 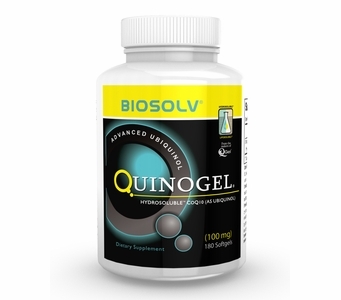 Quinogel® is the only Ubiquinol Coenzyme Q10 supplement formulated via the patented Bio-Solv® technology. In fact, the power of Quinogel® is covered by two US patents: No. 6,740,338 and No. 6,056,971. Research, (in animals and humans), has shown Ubiquinol to be absorbed better than Ubiquinone – the more commonly available form of Coenzyme Q10. Therefore, Ubiquinol might afford an advantage over ubiquinone in individuals who do not absorb regular CoQ10 from supplements too well. Solubilized Ubiquinol might afford a significant advantage over regular delivery systems of both ubiquinone and ubiquinol. Advanced Formula 100mg Quinogel® is the first and ONLY 100mg solubilized Ubiquinol CoQ10 in a softgel. Other Ingredients: Medium chain triglycerides, polysorbate 80, gelatin, glycerin, sorbitol, ascorbyl palmitate, purified water, and annatto suspension in sunflower oil. Free of: Milk and milk by-products, egg and egg by-products, fish and fish by-products, tree nuts, wheat and wheat by-products, peanuts/oil, soybean and soy by-products. Directions: Adults: Take one (1) softsule® daily with meals as a dietary supplement or as recommended by your healthcare professional. Storage Instructions:Keep bottle tightly closed. Store in a cool, dry place at controlled room temperature 15°C-30°C (59°F-86°F). Do not refrigerate. Quinogel®, Q-Gel®, Biosolv® and Softsule® are registered trademarks of Tishcon Corp.
Hydrosoluble™ and Liposoluble™ are trademarks of Tishcon Corp.
Hydrosoluble™ formulation is covered by U.S. Patent No. 6,056,971.